Drumheller is a great little town for families especially if you have a dinosaur lover in your house! The town is a 1.5 hours from Calgary and is also called the “dinosaur capital of the world”. Did you know there is also a halal restaurant in Drumheller? 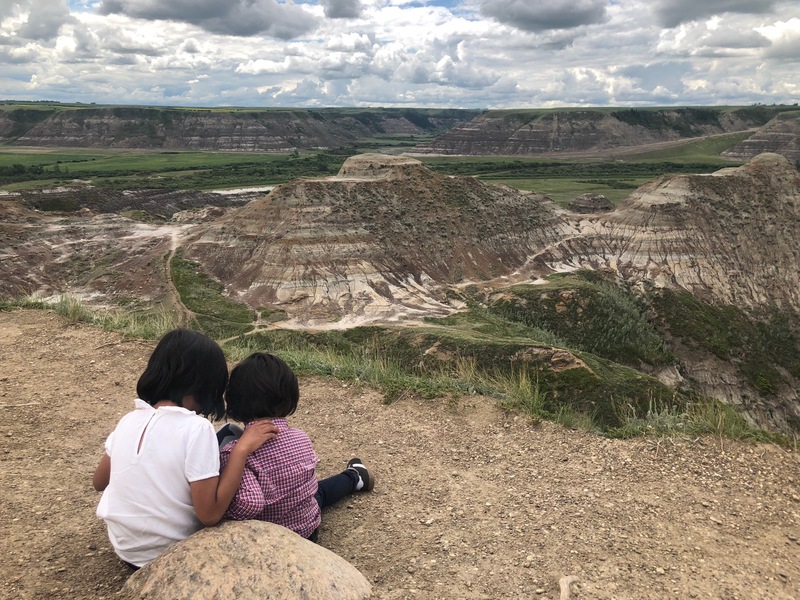 Keep reading for all these details and the top fun things to do in Drumheller with kids. This world-class museum tops the list of things to do in Drumheller with kids. It is a famous tourist attraction and a center for palaeontological research. Adults and children alike will find a lot to explore in this hands-on museum with dinosaur fossils, facts and fun exhibits. However, only go to this museum if your child is atleast above 7 to get the most out of the experience and your ticket cost. There is a great walk behind the museum to get a feel of the Canadian badlands. Drumheller town center is home to the “world’s largest dinosaur” which is a huge dinosaur structure that you can climb inside all the way to the top for a unique view of the Canadian badlands area. My kids were happy to climb around on the feet and we skipped the lines (and ticket) to climb inside the dinosaur. The children will enjoy the spray park just as much, which is across the parking lot and you can enjoy a better view of the dinosaur statue as your children beat the heat in the water. The spray park is weather dependent and do check if it’s open. There are two popular canyons in the area: horseshoe canyon and horse thief canyon. We found horse thief canyon to be less busy. It’s close to the Royal Tyrrell museum. My kids had the most fun here and it was entirely free! There are amazing panoramic views of the valley and mischievous gophers poking their heads out of their homes in the ground. My kids dug for dinosaur fossils and tried to feed the gophers grass as we enjoyed the breathtaking views. Follow the directions for “Hoodoos Trail” on google maps to enjoy these amazing formations a little out of town. There are amazing photo ops and my children loved digging around pretending to be paleontologists. Do remember your sun hats. It can get very hot! I will admit that the highlight of the day for my husband and I was finding out that the Athens Greek restaurant in Drumheller serves halal chicken and lamb! The owner confirmed this to us and ensured that the halal meat was cooked separately. The restaurant is family run and one of the most kid-friendly ones I have experienced. There was a diaper change table in the washroom and even a potty seat for the little ones! There is so much more to do in Drumheller with kids including lots of fun playgrounds, spotting the many dinosaurs all over the city and the suspension bridge. The entire town owns its dinosaur heritage and themed around it. Do remember that it can get very hot and the area is notorious for its mosquitoes so plan and pack accordingly! Have you been to Drumheller with kids? What did you enjoy the most?